Picture #1: Sales decreased once again in July, continuing the trend that started in the fall of 2005. July home sales totaled 501,000, a decrease of 11.8% from the 568,000 units that sold in July of 2007. 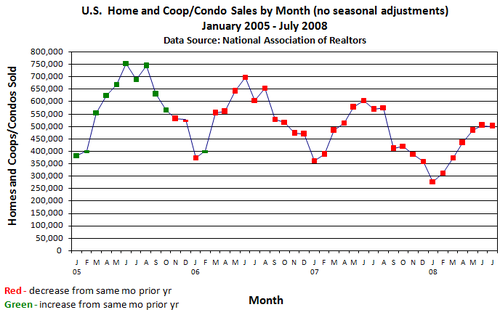 Picture #2: The 11.8% decrease in July is the twelfth straight month with a year-over-year decrease of at least 10%. 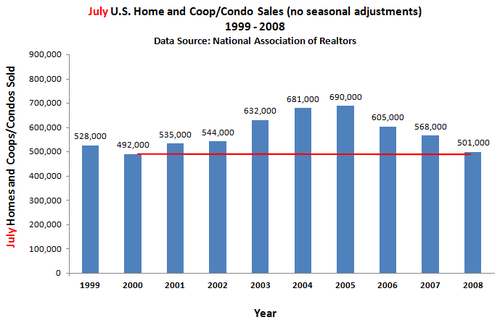 Picture #3: Sales volume in July was at its lowest level since July, 2000. Next up: How housing supply has changed over time. Let's revisit this graph from our previous post, which shows unadjusted existing home sales volume dating back to January of 2005. January is always the slowest month for home sales. Starting in February, home sales always increase in each of the 5 following months, where they peak in June. Starting in July, home sales start to recede from the peak until they bottom out in January and the cycle starts all over again. There is an interesting nuance for the month of August. August typically includes a jump in sales from the month of July (but remains below the peak month of June). Most likely this is due to the large group of buyers who are working to close on their homes before the beginning of the school year. Month-to-month comparisons only make understanding the trends more confusing. The best way to make comparisons is on a year-over-year basis (see graph above). Seasonally-adjusted numbers don't add value. Why is a seasonal adjustment necessary when all we need is the unadjusted numbers from the same month of the previous year? Next post: a look at the existing home sales numbers for the month of July. A host of media outlets report the seasonally-adjusted existing homes sales figures that are published monthly by the National Association of Realtors. The typical report, which emphasizes month-to-month changes, doesn't work for me. It doesn't do a good job of articulating the prevailing trends, which we all know are heavily influenced by the seasons. Picture #1: Existing home sales have been declining on a year-over-year basis (noted by the red data points below) since late 2005. 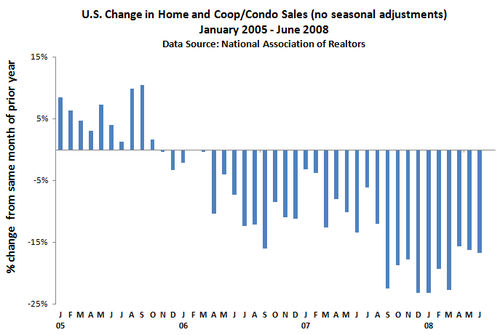 Picture #2: Year-over-year existing home sales have decreased by at least 15% each month dating back to September of 2007. 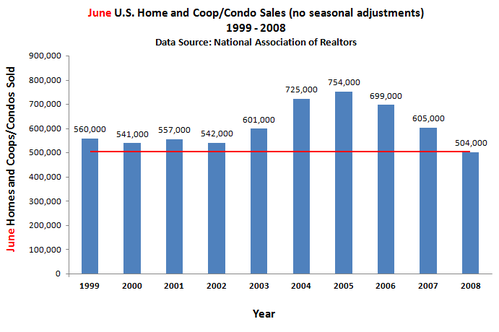 Picture #3: June of 2008 was the slowest June for existing home sales in at least 10 years. My take: The macro numbers show that sales have decreased to levels we haven't seen in a long time, while common sense says sales need to move higher before inventory decreases in a meaningful way. Until that time comes, expect continued pressure on prices.